... the lady who caught it has just got engaged- and her engagement was on the day of our 4 month anniversary too!!! I'm not superstitious so think that this engagement would probably have happened without her catching it... but its still extra exciting news knowing that she did catch it!! For me this news is far nicer than if I'd kept my bouquet and had it framed- so if your still debating throwing it I say DO IT AS YOU MAY MAKE SOMEONE ELSES SPECIAL DAY DREAMS COME TRUE! I'm really pleased I threw mine too - the girl who caught it now has a deal with her boyfriend that if she catches 3 they'll get engaged Her sister is getting married a week on Saturday & she's going to another wedding 2 weeks after so she's in with a chance! OK obviously didn't work then! oh what a lovely story. Wish I'd thrown mine - didn't like it! Shoegal the link didn't work either (for me anyway).... Planned to hold onto mine but maybe i should toss it...... will have to position single friends near the front! The girl who caught it at my friend's wedding also got engaged a few weeks later! 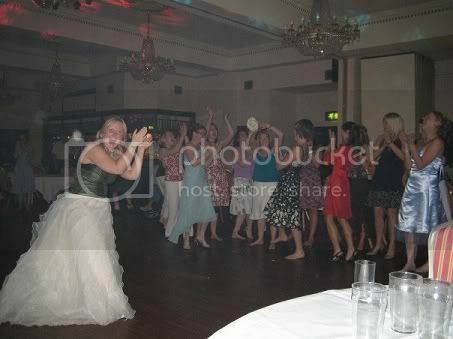 i went to a friend's wedding in OCtober 2006 - and my H2B propoosed 2 weeks later! so will definately be throwing mine! Sorry that should say - i went to a friend's wedding In october 2006 - caught the bouquet - and h2b proposed 2 weeks later! Aww that's so nice! I plan on keeping mine though, lol. I'm glad you all enjoyed the story! I'm pleased to hear that others have exciting bouquet stories too. I understand why people chose to keep them but I'd have probably forgotten about mine after honeymoon and just left it in a freezer for ever so am so glad I threw! bride2be070707 , I got married in a church in Manchester and had the reception in Britannia Country House Hotel, West Didsbury. I'm glad you like the photo- I found it on a friends facebook site! (Incidently, I got changed into a tartan bodice for the evening ceilidh as I'm orginally a Scot and married a Mr McLean). We went to a wedding yesterday and all the single women were being really reluctant to stand behind the bride for her to throw the bouquet, so in the end we were all pushed out behind her. I thought it was a bit pointless me standing there given I get married next Saturday, so I stood right at the back of the crowd. And low and behold, she threw the bouquet and everyone in front parted sideways - a bit like the biblical Red Sea - and the bouquet landed at my feet! I've never caught a bouquet before - so it was quite bizarre - but I guess it was right - I am the next person that was there to be getting married! Fantastic news! My sister wants me to throw mine... in her direction apparently!